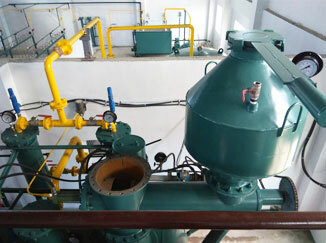 We are trusted for manufacturing, designing and exporting high quality acetylene gas plant with capacity of 25m3/hour. We use the best technology in the manufacturing to ensure efficient and smooth functioning. Our acetylene plants are fabricated with designing that incorporate the latest features and are fully automated, requiring only a single operator to run the machinery. Stainless steel is used in the fabricating of the machinery. Manufacturing is carried as per internationally approved quality standards including ISO 9008:2015 and CE. Acetylene gas is a colorless and highly flammable gas having a garlic-like odor. It is considered as the most efficient of all fuel gas which is ideal for applications in steel plants for oxy-acetylene gas cutting, welding and flame cutting. 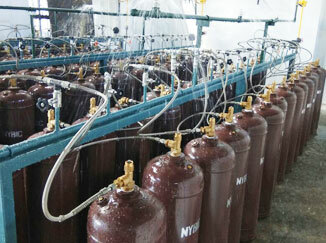 Our acetylene gas plant generates high quality acetylene and is completely explosion-free. Efficiency of the fuel gas is because of its superb heating with minimum thermal waste. Moreover, it requires least amount of oxygen for its combustion, which increases its effectiveness. It is mixed with acetone for prevention of decomposition. During the chemical reaction between calcium carbide and water, a great deal of heat is generated that needs to be moderated to avoid explosions which is duly take care of in our acetylene gas plants. Calcium carbide is first beaten into a powder in a pulverizer before it is reacted with water. 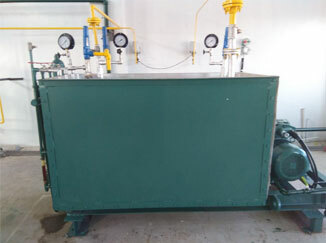 Now, the powdered calcium is added through a gas tight hopper valve arrangement to the acetylene gas generator which has sufficient amount of water to discharge lime slurry made of 85 % to 90 % water. All the while temperature is maintained below 90 deg C and the pressure is maintained at 2 atm. We are one of the leading acetylene manufacturers making and exporting acetylene gas plant using the modern technology and amazing designing. Upon installing our plant machinery, we assure that you will be able to make as much acetylene gas as you want and there would be no fear of running out of its supplies. For meeting contingencies, you will be able to store the gas as well. This way you will have acetylene gas 24*7. There is no denying the fact that generating onsite acetylene gas is a lot cheaper than buying supplies from an acetylene gas retailer. Always having backup will make you confident about continuous working of your manufacturing processes. The plant is fitted with cylinder refilling and storage equipment. Our acetylene gas plants are trusted for functioning smoothly with high precision. Manufactured with high quality materials, our acetylene systems are known for their reliability, durability and delivering top performance. Because of its amazing automation, it can be operated by a single technician, not required to have specialized knowledge. We also provide specialized on-site training, videos and training manuals. It is highly advised that you replace compressors and filter components regularly to keep them in top working condition. Acetylene is a highly flammable gas which can cause numerous hazards as it can easily explode. Therefore, it is highly recommended that acetylene gas is transported, stored and handled exactly as per the safety standards and measures explained in our safety manual. This ensures safety as not following proper safety methods usually results in fatal accidents. It has been seen that acetylene cylinders bought from gas retailers are more risky as they do not follow proper safety standards. We strongly advise our customers never to ignore safety measures. It is a profitable investment as your return on investment (ROI) will be squared off in two years. After 2 years, your investment will be only adding to your profits. It goes without saying that purchasing an acetylene plant from us you will be taking your business trajectory in the direction of increasing revenue no matter whether you are a gas retailer or a company engaged in manufacturing. Acetylene gas has number of other applications as well apart from its use as a fuel gas. It is used for making plastics and chemicals. It also finds application in organic synthesis and chemical synthesis.